Let us recall some of the characteristics that are usually associated with Slow Cinema; unknown actors / actresses, tendency to frame characters in medium or long shots, little dialogue, if any. Naturally, there are always exceptions to the rule, and Tsai Ming-liang’s Visage (2009, watch the trailer here) demonstrates that you can slightly alter these characteristics without compromising the actual nature of slow film. 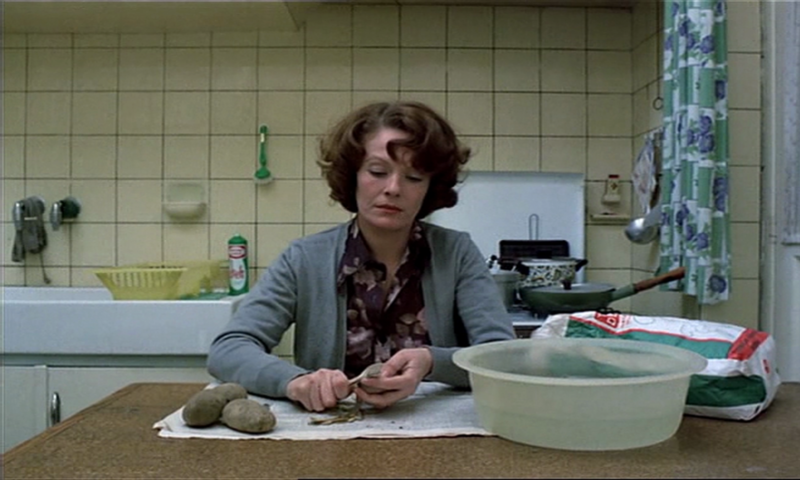 As with every slow film, Visage is difficult to sum up. I could say, in brief, that it is about a Malay director shooting a film in France. It could even be an homage to Truffaut, whose films have greatly influenced Liang. But the real interest is not so much the story. The film’s strengths lie, as usual, in the cinematography, the banal, often ridiculous incidents, and in the scenes, which often cause a WTF in my head. Visage is by all means a typical Tsai Ming-liang film. Yet, this films make me question if the characteristics we researchers have come up with, are necessary for a slow film. What’s different about Visage? As the name (Face) suggests the focus lies in faces, which are shown in close-up. It is rare that close-up shots are used in slow films (hence the idea of painting), but here it comes as natural as in any other film. Not surprisingly, it feels more intense, more intimate. We’re closer to the character and can decipher his or her facial expressions. I would call it a new dimension in the art of Slow Cinema. Also, Liang makes use of famous French actors and personalities. Laetitia Casta plays the Star, Jean-Pierre Léaud the King (he played Antoine in The 400 Blows by Truffaut), Fanny Ardent plays both the producer and the Queen. And this is not the end of the list of French actors. All three, however, are ‘popular’ personalities, and yet, to my surprise, they did a wonderful job in this slow film. True, they talk more than the Malaysian actors, hence the aspect of little dialogue is only partly valid here. Don’t get me wrong, it’s nevertheless an almost silent film. But, proportionally, there’s more dialogue amongst the French actors than amongst the other half on set. Despite diverting away from his usual concept, if only slightly, Liang, one of my favourites out there, demonstrates with Visage that it can be unhelpful to think too much in terms of definitions. There’s a lot more to the film, so updates might follow in the course of my research. Thanks for introducing me to the work of Tsai Ming-Liang. What a great filmmaker! Don’t know if you have had the chance to read this article on his work, but if not, I think you may like it. Great stuff. Thank you very much for the link!